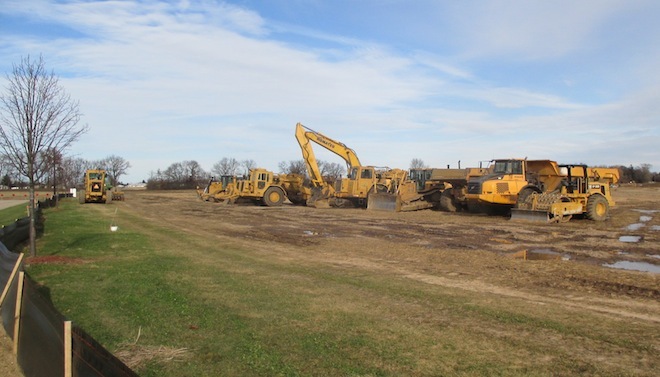 The Town of Salem has broken ground in preparation for infrastructure improvements for its business park, which is on Highway C, next to the Salem highway/fire building. Town of Salem Administrator Pat Casey said that three weeks ago, work was started to contour the land, including marking roads and laying out storm water ponds. The plan includes berms to buffer residential areas that are adjacent to the business park. The business park infrastructure should be completed by August 2016, but new businesses could begin construction as early as next March, according to Todd Battle, Kenosha Area Business Alliance president. Casey said KABA has been aggressively recruiting and Battle did confirm that he is working with several businesses about relocating to the Salem business park. Other possibilities would be to sell the parcel to a private developer who would then build and rent to businesses. Battle said that a number of businesses have chosen to move to southeastern Wisconsin from Illinois. “Wisconsin has a stable, cost-effective utility system, a good economic climate with a very competitive tax rate and in the past 24 months, 20 Illinois businesses have relocated to eastern Kenosha County,” he explained. The demand is high and prices in western Kenosha County will be lower than those parcels closer to I-94, yet there is easy access to the interstate from the planned Salem business park. The town purchased the 40 acres in a short sale last year and paid $350,000, according to Casey. This year, KABA purchased the adjoining 42 acres and together with the town, is working on developing a business park. As things progress, Casey said, KABA will buy the original 40 acres from Salem at the sale price. “We want to keep the costs reasonable,” he said, “to make it easy for businesses to locate here. Salem borrowed $4.5 million to get the tax incremental financing district started. The additional taxes generated by the improvements will be used to pay back the loan. Wetlands, roads and right of way will consume 16 acres of the development. Leaving about 65 developable acres. As the business park progresses and lots are purchased, the assessed value of the area will rise. In a TIF district, participating taxing bodies agree to receive a set amount of taxes from that area for a set period of time. The incremental increases will then be used by the town to pay back loans taken out to develop the business park.